Festivals hold a great importance in Indian culture; they are a tool to bring life to a state of exuberance and enthusiasm. One such festival is Navratri, which is celebrated with utmost zeal in all across the country. The nine day celebration is completely devoted to the worshipping of goddess Durga in all her manifestations. This flamboyant festival is celebrated in different ways in different parts of India. Here are the best places to visit in India to rejoice Navratri celebration. 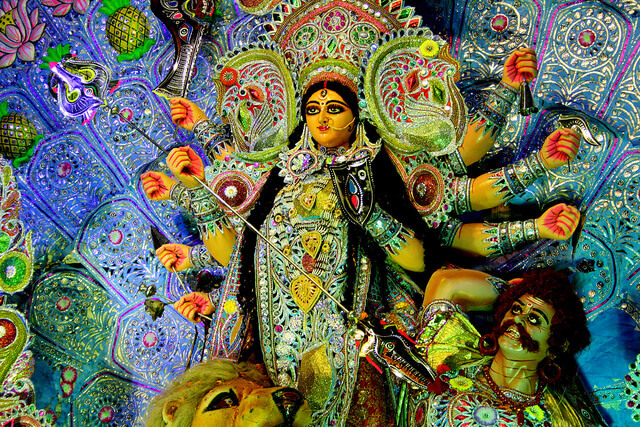 Navratri is celebrated as Durga Puja in the East Indian state of Bengal. The last four days of Navratri are celebrated with extreme fervour, and the whole Paschim Banga is adorned with vibrant colours and lights. It is believed that goddess Durga descends from heaven to her maternal home on earth, and she is welcomed with much warmth and love. Huge pandals are decorated during Durga Puja and life-sized idols of Durga are worshipped. The tenth day of Navratri is celebrated as Durga’s victory over evil. Attend Durga Puja, the biggest festival in the eastern part of the country with West Bengal tour packages. Gujarat is the only place where all nine days of Navratri are celebrated with utmost enthusiasm. People in all over the state gather in open spaces to celebrate feminine divinity. A clay pot filled with water and a silver coin, which symbolizes Garbha or the womb, is the main prominent feature of Navratri celebration in Gujarat. 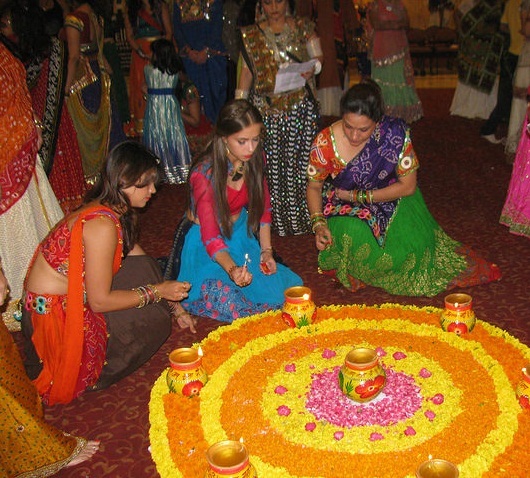 Women adorned in glittery outfits perform the folk dance Garbha and Dandiya around the pot. If you are in Gujarat, being a part of Garbha and Dandiya is one of the best things to do in Gujarat. Maharashtrians also drench themselves in the festive spirit of Navratri. Navratri celebration in Maharashtra bears resemblance to celebrations in Gujarat due to their close proximity. People in Maharashtra celebrate Navratri as a new beginning, and buy something new for their home. Also, women invite their female friends to their home and give them coconut, beetle nuts and beetle leaves as gifts. Garbha and Dandiya nights are popular in almost every locality in the state of Maharashtra. In big cities like Mumbai, people go gag over disco Dandiya nights. The Hindus of Himachal celebrate Navratri with utmost devotion. The tenth day of Navratri celebration is known as Kullu Dussehera in Himachal, and it marks the return of Lord Rama to Ayodhaya. People from Himachal and other states of India visit various shrines to pay their obeisance to goddess Durga. One should definitely take Himachal Pradesh tour to be a part of the famous Kullu Dusshera. Deities are taken out for processions and brought to fair grounds to pay homage. 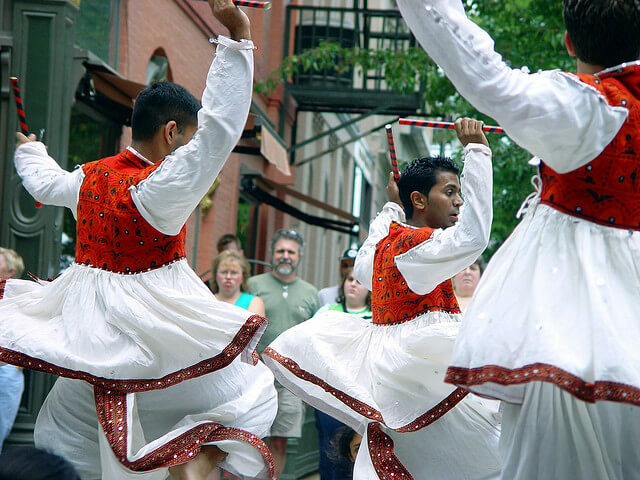 It is one of the most spectacular processions in the country and attracts lots of tourists every year. 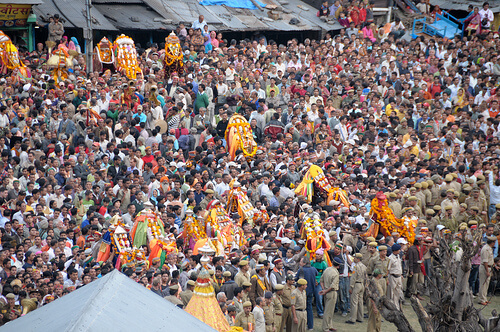 Drench yourself in the festive zeal of Kullu Dussehra with Himachal tour packages. 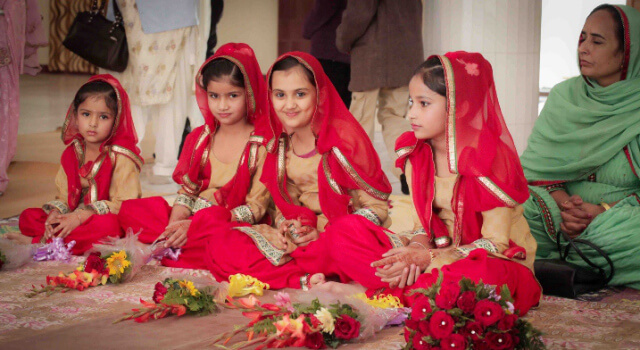 Navratri in Punjab is celebrated in quite a unique way. Punjabis pay their obeisance to goddess Shakti by going on a fast for the first seven days. And the fast is broken on Ashtami, the eighth of Navratri by organizing a bhandara for 9 young girls (Kanjikas). Navratri is celebrated as “Bathukamma Panduga” meaning ‘Come Alive Mother Goddess’ in Andhra Pradesh. 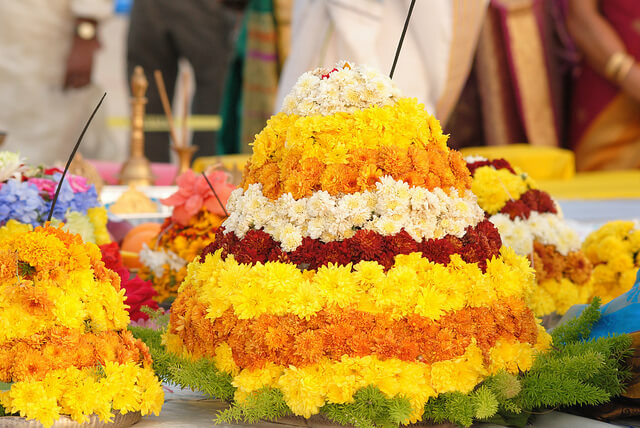 Navratri celebration is dedicated to goddess Gauri, and the idol of goddess is enshrined in a flower stack called Bathukamma. It is not only one of the most important, but also the biggest festival in Andhra Pardesh, especially in Telangana region. Women clad in silk sarees and gold jewelry gather around Bathukamma to seek the blessings of goddess Gauri. Navratri is popularly known as Mysore Dasara (Nada Habba) in Karnataka. The 10 day dasara of Mysore is famous all across the country. The beauty of this festival is that it is celebrated in the same way as it was rejoiced in the 17th century by the Vijaynagra Dynasty. One must visit Karnataka during Navratris to see elephants’ processions on the street and huge exhibitions of artefacts and handicrafts. 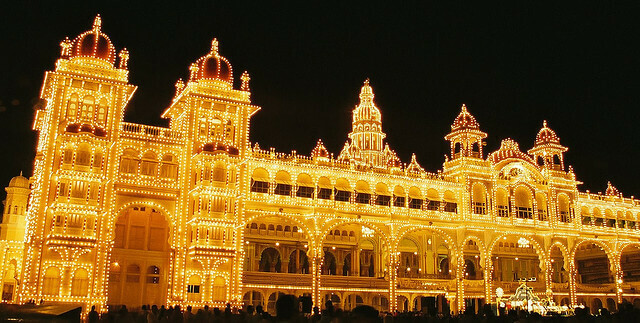 Mysore Palace is the main attraction during Mysore Dasara in Karnata. It is illuminated with 1 lakh light bulbs for all nine days of the festival. Be a part of the festive fervor of Karnataka with Mysore tour packages. The zeal amongst people knows no boundary when it comes to Navratri celebration. Here are the best places to rejoice Navratri to the fullest.